Another of the paper-fruited bloodwoods, this species was once included with the Ghost gum, as Eucalyptus (Corymbia) papuana. 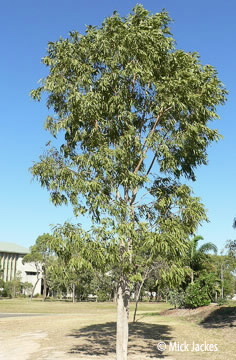 The trunk is covered by smooth whitish bark but there are often small brown scales of bark remaining attached, particularly where the trunk has been damaged as by insects or towards the base. Streaks of resin may sometimes be seen on the trunk. The long narrow leaves usually have an undulate and wavy margin.